Light Weight RSS Reader With PHP | Web and mobile development tutorials. From last two days my brain is empty. I was not getting any new ideas for my blog post. After I jumped into my previous projects I found XML reader with PHP project. I did that 1 year back(approx). So I decided to convert that into Simple Light Weight RSS Reader(of-course RSS also a XML!). Now here it is! Have a look at the demo below before start. If who want to test the demo or downloaded script. Please Make sure your feeds are RSS format not atom format. If it is atom It won’t work in this tutorial. 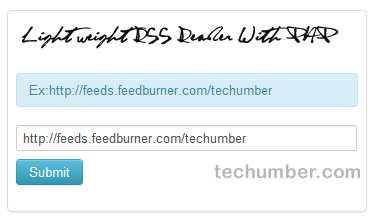 You can simply convert feed format form atom to rss in your feedburner settings if you use feedburner for your feeds. The is very simple. Here we will have only one file. This is the simple form. Here you can enter your feed url. In this code first it will check if any value in $displayrss variable. If yes then it will display the result. In this code first we check if user entered any feed url. If not we will assign default url http://feeds.feedburner.com/techumber (This is techumber feed url). You can change it if you want.